Jon C. Cook is Senior Director of Investigative Toxicology at Pfizer Inc. (1998–present) where he has worked on early and late-stage drug development teams. Prior to joining Pfizer Inc., he was a Senior Research Toxicologist at DuPont-Haskell Laboratory (1987–1998) and a Postdoctoral Fellow at Chemical Industry Institute of Toxicology (1985–1987). Dr. Cook received his B.S. in Physiology from the University of California, Davis, and his M.S. and Ph.D. degrees in Toxicology from North Carolina State University. He is a Diplomate of the American Board of Toxicology and a Fellow of the Academy of Toxicological Sciences. He served on the Editorial Boards of the Journal of Toxicology and Environmental Health (1988–1994), Fundamental & Applied Toxicology (1995–1998) and Toxicological Sciences (1998–2002). Dr. Cook received the Rutgers University Robert A. Scala Award in Toxicology in 1998. Dr. Cook has been active in the Society of Toxicology (SOT) throughout his career. 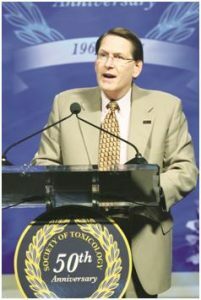 He was elected to the “Presidential Chain” of the SOT serving as Vice President-Elect, Vice President, President, and Past President from 2009–2013 and to Council from 2002–2004. He has served on numerous SOT Committees including the Endowment Board (2007–2010, 2013–2015), Services Strategy Committee (2006–2007), and Continuing Education Committee (member, 1991–1996; Chair, 1993–1994). He has served as the Vice-President-Elect/Vice-President/President/Past-President of the SOT Carcinogenesis Specialty Section (2001–2005).